In one respect, this post will be outdated very quickly, as September 23, 2017 will come and go. However, the principles that are expressed in the articles linked below are applicable to other events as well as the excitement and confusion they will generate. Although the Bible clearly tells us that no one can know the time of Christ's return, some folks like to commence to doing "date setting", and think they've figured out some special message or code. These consistently fail. Yes, Genesis 1:14 has the word "signs", but that is not a call to use the heavens for divination on Revelation instead of their real purpose: timekeeping. "But there's a tetrad of blood moons!" Yes, the moon turns read during a lunar eclipse. Has to do with refraction. 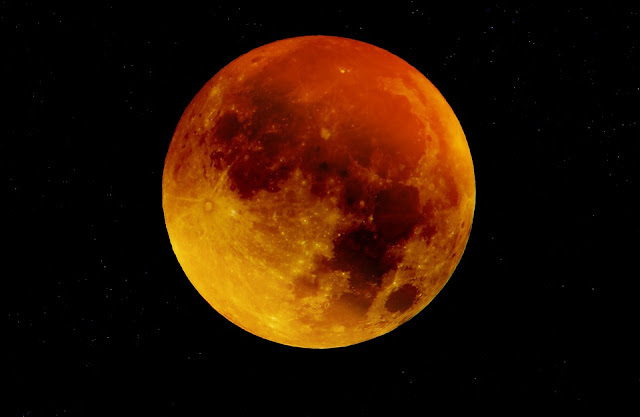 The four blood moons thing has happened before, too. Pass the cheese curls, willya? "The sun will be in Virgo, the sun and some planets will be in it, and Virgo means Mary the mother of Jesus!" That constellation has been known by many names, and there is no reason to believe it refers to Mary. The sun and planets go into that constellation all the time. Got any more spinach dip? "Three planets in Leo, the Lion of the tribe of Judah, makes the number of stars in it up to twelve!" You may be unclear on the concept of a constellation, old son. It is based on our view from Earth, but there are many more stars out yonder than we see here. Stargazers picked out certain stars and "saw" Leo (an ornery cuss, and has no real association with Jesus), but had to ignore other visible stars. Yes, planets were considered "wandering stars" in days gone by, but to add three planets to bring the total of Leo's stars up to twelve is really reaching. Can I have a slice of that pizza? "But there's an ancient gospel in the stars!" No, not really. That concept has been discredited. Trying to Christianize astrology is not a good idea. Stay away from divination and other occult practices, God hates that stuff. Do you have any antacid on hand? I ate too much of your food. Stargazing is fun and educational. If you're in areas that frequently get cloudy, have difficulty in traveling, or something else, you can do a form of it on your computer. Here is some astronomy software, and I see that Stellarium and Celestia are freeware that get recommendations. But concerning that day and hour no one knows, not even the angels of heaven, nor the Son, but the Father only (Matthew 24:36 ESV). But apparently these soi-disant prophets know better than Jesus, God the Son and the Incarnate Word (and see Hypostatic Union: Did Jesus know when he was coming back?). Added to that hubris is usually a basic ignorance of astronomy. To finish reading, click on "Will the world end on 23 September? — How to think about doomsday scenarios", which has quite a few links for further reading. Also, you may want to see a similar article, "What Will Happen on September 23, 2017?" Just for fun, come back here and re-read this post after that date.